There’s a lot of excitement about the possibilities of 3D printing. It could one day allow you to design and print just about any physical object you’d like. For now, though, 3D printing is limited to the domain of simple plastic trinkets and toys. Which means that the technology is perfect for kids to play around with! 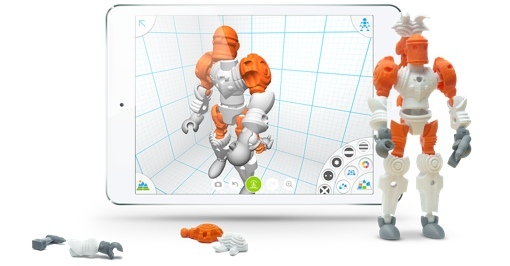 Autodesk, the company behind the popular AutoCAD design software, has created the perfect way for kids to get involved in 3D printing: The new Autodesk Tinkerplay app (iOS, Android, Windows) lets them design and customize their own 3D action figures. Kids can start by loading a pre-designed character and swapping out template body parts, or design their own character from scratch. The app lets them select between various colors and textures, too, for even more customization. When a character is completed, kids can play around with it in the virtual world of the app, placing it in different scenes and posing it as they’d like. But the killer feature here is that kids can then export their creation into an STL file that can be sent to a 3D printer. Just take the file to a store with a 3D printer (like Staples or The UPS Store), pay a small fee, and your child's creation will come to life in the real world. Or, if you’re lucky enough to own your own 3D printer like the MakerBot, Tinkerplay figures can be printed right at home. Printed pieces easily snap together into a poseable model. Want to check the free Tinkerplay app out? It’s a free download for iOS on the Apple App Store, for Android on Google Play and for Microsoft Windows on the Windows Store. You can also visit the Autodesk Tinkerplay website or watch the short video below to see the app in action.